"Gold Digger" is a song recorded by American rapper Kanye West featuring guest vocals by Jamie Foxx. Released as the second single from West's second album, Late Registration (2005), "Gold Digger" peaked at number one on the US Billboard Hot 100 on September 6, 2005, becoming West's and Foxx's second number one single. Co-produced with Jon Brion, the song contains samples of Ray Charles' "I Got a Woman". The single broke a record for the most digital downloads in a week, selling over 80,000, and was also the fastest-selling digital download of all time; both records have since been broken. It was 2005's second-longest running number one on the Billboard Hot 100 at ten weeks, behind "We Belong Together" by Mariah Carey. At the 2006 Grammy Awards, "Gold Digger" was nominated for Record of the Year and won the award for Best Rap Solo Performance. The song lists at number 60 on Billboard magazine's All Time Top 100 and at number 9 on the Billboard Hot 100 Songs of the Decade. "Gold Digger" was voted number 20 on VH1's 100 Greatest Songs of Hip Hop. As of January 2011, the song has sold over 3,000,000 copies in the United States. Upon its release, many surmised that West conceived "Gold Digger" after watching Jamie Foxx's Oscar-winning portrayal of Ray Charles in the biographical film Ray. However, he had actually constructed the beat of the song long before the movie was even developed. West originally produced and recorded "Gold Digger" in Ludacris's home in Atlanta for Shawnna's 2004 debut album Worth Tha Weight and had written the chorus from a female first-person viewpoint: "I'm not sayin' I'm a gold digger, but I ain't messin' with no broke niggas." However, for reasons unknown, Shawnna passed on using the song. Not wanting to let it go to waste, West decided to keep the beat for himself and add lyrics expressed from a male's point-of-view. The second verse of "Gold Digger" was the first to be written, as West used to rap the verse in early 2004 while on tour promoting his debut album, The College Dropout. The first verse was made later in the year while West was on Usher's Evolution Tour. Lastly, the original third verse was taken from an unreleased song called "Drop Dead Gorgeous," which West had produced and rapped on for Murphy Lee of St. Lunatics. About a year later, right before "Gold Digger" was set to be released as a single, West decided to write a different third verse and in a week the new song was recorded and mastered at Sony Music Studios in New York City. The idea of employing Jamie Foxx specifically to sing an interpolation of Ray Charles' "I Got a Woman" in place of its initial sample did in fact arise from West seeing Ray with his friend John Mayer. Foxx's vocals were recorded over many takes; in one version he sang from start to finish, but the track was retracted as his performance didn't coincide well with the song's instrumentation. After recording another version, Foxx decided to re-record it once more as he felt it contained too many explicit lyrics. Once the track was finally in place, it was layered with additional instruments provided by American film score composer Jon Brion and individually selected by West. By the end of their very first studio session together, the pair had completed the basic tracks for the final version of "Gold Digger". Despite being a featured singer, Foxx's part only appears in the intro and the rest of the song uses West's vocals and samples of Charles. "Gold Digger" contains samples (as well as an interpolation during the introduction) of "I Got a Woman" by Ray Charles, and a bouncy beat formed from handclaps and scratches by DJ A-Trak. Towards the end, the song employs vintage 1970s synthesizers which emit a honking sound in cadence to Kanye's voice. West delivers a tongue-in-cheek lyrical narrative within "Gold Digger" in which he critically depicts the disastrous life of a man married to a woman who manipulates him for financial gain. However, another story arises within the third verse, which illustrates a once destitute black male who earns a fortune and decides to leave a loyal, unselfish girlfriend for a white girl. The song's music video was directed by Hype Williams, who also directed West's previous video, "Diamonds from Sierra Leone". Shot in a widescreen letterbox format, using stylized art direction with few props, the video features performances shots of West interspersed with footage of Williams' trademark female video models depicted as "pin-up" cover models from fictional vintage magazines. The titles of the magazines on whose covers the women appear reflect the correlating verses in the song. Foxx is also present, lip-synching both his own parts and the Ray Charles vocal sample. John Legend makes a brief cameo. At the 2006 MTV Video Music Awards, "Gold Digger" received nominations for both Best Male Video and Best Hip Hop Video, but did not win either of these awards. 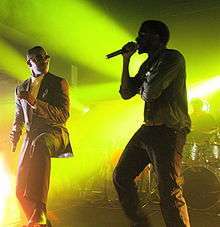 West and Foxx performing "Gold Digger"
Following the chart performance of "Diamonds from Sierra Leone", which failed to crack the Top 40 of the Billboard Hot 100, West's label became concerned with how a follow up single would perform. Their concerns were unfounded as "Gold Digger" became a success, hitting number one on the Billboard Hot 100, Pop 100, Hot R&B/Hip-Hop Singles & Tracks and the Hot Rap Tracks charts. When Late Registration was released, the album version of "Gold Digger" was first made available for download. Approximately 80,000 digital downloads of "Gold Digger" were sold through legal music services such as iTunes and Napster in that first week, making it the most successful digital sales debut ever. The song broke the record for the most digital downloads sold in one week, and the record for the fastest selling digital single of all time, both previously held by Gwen Stefani's "Hollaback Girl". "Gold Digger" sold over 1,000,000 downloads during its seven weeks of release. This makes "Gold Digger" one of the first songs in history to sell over 1,000,000 downloads in the United States. "Gold Digger" was certified as 5 times platinum on April 10, 2014. The high digital download sales helped propel the song from number 19 to number one in one week, the fifth highest jump ever to that position on the Hot 100. The jump ended the 14-week (and 10 consecutive week) run of Mariah Carey's "We Belong Together" at number one, and kept Carey's "Shake It Off" from replacing "We Belong Together" as the number one single. The song spent 10 weeks at the top of the Hot 100 until rising R&B star Chris Brown's hit "Run It!" shot up to the pole position for the week of November 19. "Gold Digger" also became West's first Top 10 single on the Mainstream Top 40 chart, peaking at number two. On the Pop 100, "Gold Digger" also broke a record by jumping from number 94 to number two, giving West the record for the biggest ever jump on that chart. In MAX music TV's top 1000 songs of all time, 'Gold Digger' was number 462 on the list. By reaching number one, "Gold Digger" gave Charles his first Hot 100 chart-topper as a songwriter, credited as a result of the "I Got a Woman" sample. As an artist, Charles topped the Hot 100 three times in the 1960s, but always with other writers' songs. As of May 2011, the song has sold 3,083,000 copies in the US. On April 10, 2014, "Gold Digger" was certified as 5 times platinum. "Gold Digger" is Kanye West's second highest charting single in the UK, only behind his number one single "Stronger". It was only held off the top spot by The Pussycat Dolls' "Don't Cha". It is by far West's longest charting single in the UK having amassed an impressive 48 weeks inside the top 100 songs. 295,000 copies of "Gold Digger" have been sold in the UK as stated by the Official UK Charts Company. The song was also later sung by the Oceanian Hip-Hop duo Noozfa & Izzei , and they made a crunk remix featuring White Dawg, and Lil' Jon. In addition, it was also sung in Kingston, Jamaica by various other artists like Lil' Bow Wow, C-Murder and Beenie Man. "Gold Digger", done in a polka beat, is the last segment of "Polkarama! ", the polka medley on "Weird Al" Yankovic's album Straight Outta Lynwood. This version substitutes a second "broke" instead of "niggas", like the edited music video. English solo artist Dear Landlord performed an acoustic version of "Gold Digger". Vitamin String Quartet recorded a string quartet version of the song for one of their Unstrung albums. Christian parody band ApologetiX parodies the song as "Bone Digger" on their album Wordplay. The Rhode Island-based jazz/funk/hip-hop group Milkbread often covers the song at live shows with a funkier, horn-based groove. Welsh indie rock band The Automatic recorded a cover version of the song, which features on Radio 1's Live Lounge CD, as well as later being featured on their final single Raoul. During Leeds Festival 2006 they performed it live with Adequate Seven and the lead singer and saxophonist of Capdown. They also performed it live at the 2007 Reading festival, with fellow Welshmen, Goldie Lookin' Chain and at the 2007 Get Loaded In The Park. At the Newquay Boardmasters Festival in 2006, they performed it live with The Mystery Jets; Get Cape, Wear Cape, Fly and My Elvis Blackout. On September 13, 2012 The X Factor UK contestant Lucy Spraggan performed the song on week two of season 9. In 2006 a drum and bass remix was released by High Contrast. Lil Wayne freestyled over the beat for his mixtape, The Suffix. In 2005 American DJ and producer Diplo remixed the track; he edited the song's chorus to resemble the voice of Ray Charles. The electronic track was titled "Gold Digger (Diplo Mix)" and appeared on the release "Hollertronics Vol 3" on the Money Studies Records label. A politically charged mash-up of the song titled "George Bush Doesn't Care About Black People" circulated following Hurricane Katrina, incorporating audio of Kanye West's own assertion that "George Bush doesn't care about black people" on a televised benefit concert. The song criticized George W. Bush for his slow reaction to the plight of New Orleans and was written by Houston hip-hop duo also known as K-Otix. The single became widespread on the Internet for several weeks after the catastrophe, in some cases backing video mash-ups with photo montages from the hurricane. 2005: West performed the single with Common and Talib Kweli during the Guitar Center Spin-off Championships, held in Los Angeles. 2005: The Boondocks episode "Guess Hoe's Coming To Dinner" features the track as the backdrop of a montage of the character Cristal (A prostitute) spending Granddad's money on luxuries. 2009: In the episode "Showmance" of Glee, the cast of Glee covered the song. The song was parodied by The Fringemunks to recap Fringe episode 1.04, "The Arrival." Series 7 UK X Factor contestant Aiden Grimshaw auditioned with the song in 2010, which was praised by the judges, leading him through to the 'Boot Camp' stage of the competition. 2011: The song is featured on the show Family Guy in the episode "Friends of Peter G" which poet William Wordsworth writes the song. On October 23, 2012, the cast of The Big Bang Theory made a flashmob during the live taping of an episode, featuring the song as well as others. In the season 2 premiere of Black-ish, Jack performed the uncensored version at his school's talent show which almost got him expelled because that version included the n word, but was bleeped in the episode. B2 "We Can Make It Better"
↑ Nguyen, Hao. "HIP-HOP GEM: KANYE ORIGINALLY PRODUCED "GOLD DIGGER" FOR SHAWNNA". stopthebreaks.com. Stop The Breaks. Retrieved 1 May 2015. ↑ Shaunne, Flowers. "The 10 best Kanye West songs". axs.com. AXS. Retrieved 1 May 2015. 1 2 3 4 5 Reid, Shaheem; Perez, Rodrigo (2006-02-01). "Road To The Grammys: The Making Of Kanye West's 'Gold Digger'". MTV. MTV Networks, Inc. Retrieved 2007-08-22. ↑ Perez, Rodrigo (2005-08-12). "Kanye's Co-Pilot, Jon Brion, Talks About The Making Of Late Registration". MTV. MTV Networks. Retrieved 2006-03-02. ↑ Empire, Kitty (2005-08-28). "West Ends the Wait". The Observer. Guardian News and Media Limited. Retrieved 2005-09-04. ↑ Christgau, Robert (2005-08-30). "Growing by Degrees". Village Voice. Village Voice LLC. Retrieved 2007-04-12. 1 2 "Week Ending May 8, 2011. Songs: Rolling In The Dough - Yahoo! Chart Watch". new.music.yahoo.com. 2011-05-11. Archived from the original on October 13, 2011. Retrieved 2011-05-12. ↑ "Kanye West - Graduation". Chart Stats. 2007-09-22. Retrieved 2012-02-18. ↑ Chan, Anna (November 16, 2012). "'Big Bang Theory' cast surprises audience with 'Call Me Maybe' flash mob". The Clicker. Retrieved November 17, 2012. ↑ "Gold Digger - Kanye West". Billboard. Nielsen Business Media, Inc. Retrieved 2011-09-22. ↑ "Kanye West feat. Jamie Foxx - Gold Digger". australian-charts.com. Hung Medien. Retrieved 19 August 2011. ↑ "Kanye West feat. Jamie Foxx - Gold Digger". austriancharts.at (in German). Hung Medien. Retrieved 19 August 2011. ↑ "Ultratop.be – Kanye West feat. Jamie Foxx – Gold Digger" (in Dutch). Ultratip. ↑ "Ultratop.be – Kanye West feat. Jamie Foxx – Gold Digger" (in French). Ultratip. 1 2 "Kanye West > Charts & Awards > Billboard Singles". Allmusic. Macrovision. Retrieved 19 August 2011. ↑ "Kanye West feat. Jamie Foxx - Gold Digger". lescharts.com (in French). Hung Medien. Retrieved 19 August 2011. ↑ "Kanye West feat. Jamie Foxx, Gold Digger". charts.de (in German). Media Control Charts. Retrieved 19 August 2011. ↑ "Discography Kanye West". irish-charts.com. Hung Medien. Retrieved 19 August 2011. ↑ "Nederlandse Top 40 – week 47, 2005". top40.nl (in Dutch). Dutch Top 40. Retrieved 19 August 2011. ↑ "Kanye West feat. Jamie Foxx - Gold Digger". norwegiancharts.com. Hung Medien. Retrieved 19 August 2011. ↑ "Kanye West feat. Jamie Foxx - Gold Digger". charts.org.nz. Hung Medien. Retrieved 19 August 2011. ↑ "Official Scottish Singles Chart Top 100: 25 September 2005 - 01 October 2005". The Official Charts Company. Retrieved 29 June 2015. ↑ "Kanye West feat. Jamie Foxx - Gold Digger". swedishcharts.com. Hung Medien. Retrieved 19 August 2011. ↑ "Kanye West feat. Jamie Foxx - Gold Digger". hitparade.ch (in German). Hung Medien. Retrieved 19 August 2011. ↑ "Chart Stats - Kanye West - Gold Digger". Chart Stats. The Official Charts Company. Retrieved 19 August 2011. ↑ "Kanye West Album & Song Chart History: Billboard Hot 100". Billboard. Nielsen Business Media, Inc. Retrieved 19 August 2011. ↑ "Kanye West Album & Song Chart History: R&B/Hip-Hop Songs". Billboard. Nielsen Business Media, Inc. Retrieved 19 August 2011. ↑ "Kanye West Album & Song Chart History: RAp Songs". Billboard. Nielsen Business Media, Inc. Retrieved 19 August 2011. ↑ "ARIA Charts - End Of Year Charts - Top 100 Singles 2005". Retrieved 25 September 2015. ↑ "End of Year Charts 2005". Retrieved 25 September 2015. ↑ "End of Year Singles Chart Top 100 - 2005". Retrieved 25 September 2015. ↑ "Greatest of All Time Hot 100 Singles". Billboard. Retrieved 13 November 2015. ↑ "ARIA Charts – Accreditations – 2005 Singles". Australian Recording Industry Association. ↑ "New Zealand single certifications – Kanye West – Gold Digger". Recorded Music NZ. ↑ Late Registration (Media notes). Kanye West. Roc-A-Fella Records. 2005. Look up gold digger (kanye west song) in Wiktionary, the free dictionary.